Have you ever checked out a product review on Tom’s Guide? If so, you’re not alone. Every month, this website attracts more than 2.5 million unique visitors — that’s equivalent to the population of Toronto, the largest city in Canada. The folks at Tom’s Guide test and review everything from drones to 3D printers. They love technology. So perhaps it’s no surprise that they took a shine to the QNX technology concept car. In fact, they liked it so much, they awarded it the Tom’s Guide CES 2015 Award, in the car tech category. To quote Sam Rutherford of Tom’s Guide, “After my time with QNX’s platform, I was left with the impression there’s finally a company that just “gets it” when it comes to the technology in cars. The company has learned from the success of modern mobile devices and brought that knowledge to the auto world…”. I think I like this Sam guy. The Tom’s Guide award is the second honor QNX picked up at CES. We were also shortlisted for an Engadget Best of CES award, for the digital rear- and side-view mirrors on the QNX technology concept car. If you haven’t seen the mirrors in action, they offer a complete view of the scene behind and to the sides of the vehicle — goodbye to the blind spots associated with conventional reflective mirrors. 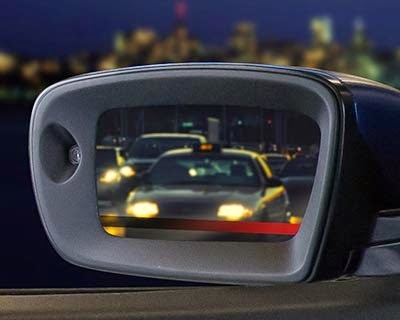 Better yet, the side-view digital mirrors have the smarts to detect cars, bicycles, and other objects, and they will display an alert if an object is too close when the driver signals a lane change. In addition to the digital mirrors, the QNX technology concept car integrates several other ADAS features, including speed recommendations, forward-collision warnings, and intelligent parking assist. Learn more here.